Description: The AMS Minority Scholarships will award funding to minority students who have been traditionally underrepresented in the sciences, especially Hispanic, Native American, and Black/African American students. The two-year scholarship is distributed once per year during freshman and sophomore years (second-year funding depends on successful completion of the first academic year).Applicants must be U.S. citizens or hold permanent resident status and must be minority students who will be entering their freshman year of college in the fall. To be eligible, students must plan to pursue careers in the atmospheric or related oceanic and hydrologic sciences. Marine Biology is not eligible. 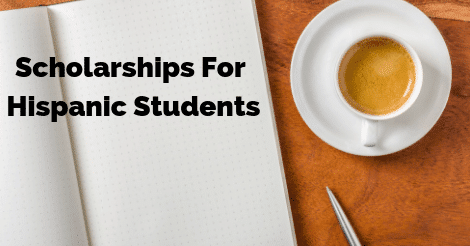 Description: ACS awards renewable scholarships to underrepresented minority students who want to enter the fields of chemistry or chemistry-related fields. Awards are given to qualified students. African American, Hispanic, or American Indian high school seniors or college freshman, sophomores, or juniors pursuing a college degree in the chemical sciences or chemical technology are eligible to apply. Description: The scholarship is designed to encourage the entry of qualified persons into the library and automation field who plan to follow a career in that field; who demonstrate potential in, and a strong commitment to the use of automated systems in libraries; and who are qualified members of a principal minority group (American Indian or Alaskan native, Asian or Pacific Islander, African-American, or Hispanic). The recipient must be a U.S. or Canadian citizen. This scholarship is for study in an ALA Accredited Master of Library Science (MLS) program. Description: The HENAAC scholarship recipients continue to pave the way for future generations of Hispanics and lead by example to empower our communities and enhance our nation’s professional technical workforce. In order to apply for the scholarship, applicants must demonstrate merit through academic achievements, leadership and campus/community activities; have a minimum 3.0 GPA; be pursuing a STEM-related degree and be of Hispanic origin and/or must significantly demonstrate leadership or service within the Hispanic community. Description: At Brown and Caldwell, we value diversity in the workplace, supporting organizations like the National Society of Black Engineers and the Society for Hispanic Professional Engineers. We also offer a $5,000 Minority Scholarship to support students who identify as minorities and are interested in pursuing a career in the environmental profession. Description: The ¡Adelante! U.S. Education Leadership Fund is a leadership development, non-profit organization dedicated to Hispanic college students. Their mission is to inspire the best and brightest Latino students to graduate and lead through scholarships, internships, and leadership training. Applicants must have completed at least 30 credit hours of college coursework prior to the upcoming fall semester and must have attended a San Antonio area high school (50-mile radius)and be a U.S. Citizen or permanent resident who is of Hispanic descent and has a minimum 2.75 GPA. Must maintain full-time enrollment status (12 hours) for the duration of the scholarship period. Description: The ¡Adelante! U.S. Education Leadership Fund is a leadership development, non-profit organization dedicated to Hispanic college students. Their mission is to inspire the best and brightest Latino students to graduate and lead through scholarships, internships, and leadership training. Must be a college junior or senior by the fall semester of the award and must be a U.S. Citizen or permanent resident who is of Hispanic descent. Applicants must have a 3.0 GPA or above. All majors are welcome to apply for this scholarship, but students must be pursuing a pre-law program and/or planning to attend law school. Applicants must be enrolled at an accredited university or public/private college in the state of Texas and have completed 90 credit hours before the fall semester. All majors are eligible but students must be pursuing a pre-law program and/or planning to attend law school. Applicants must have and maintain a 2.75 GPA or above and must be a U.S. Citizen or permanent resident. Preference will be given to female students of Hispanic descent. Description: The BLM² Scholarship Foundation program is designed to address the financial needs of minority college students and award outstanding high school graduates who plan to earn a baccalaureate degree from an accredited, four-year college or university with financial assistance. Applicant must be permanent Illinois resident, have a minimum 3.0 GPA, be a graduating high school senior and be a minority student. The student must also be enrolled as a full-time student during the coming fall academic semester. Description: Eligible candidates must have completed their first year of college at an accredited university; must have a declared major or course of study relevant to the transportation, travel, and tourism industry; and must have a cumulative 3.0 GPA. Applicants are required to submit a 500-word essay discussing the role they hope to play in advancing the future of the transportation, motorcoach, travel, and tourism/hospitality industry. Newer PostDo You Have To Pay Back FAFSA? Older PostWhy Does It Cost So Much To Go To College?